ARUNDHATI MUKHERJEE, Life is a journey of discovering your true self. Reading is a habit which we should cultivate from a very young age. The best example and best lesson or rather the best gift you can give your child is the love for reading. Good books and music are our eternal and best friends. This is the precious gift my parents gave to me and I have given to my children. Though my life is very busy managing and keeping a balance between work and home, I always try to take out some “My time” every day to connect with myself and to do what I love. Even if it is for fifteen minutes I try to read some good article or page of a book during bed time or just early morning while having my tea .Even sometimes it may be in the afternoon or any time but reading is a regular habit with me. I just cannot live without it. It helps me to recharge and energize and relax myself. Actually we can learn a lot of things from books of good writers. We come to know about their thought process, we are exposed to a larger picture of life or we may visit different places mentally being lost and engrossed in the book. We can imagine and identify ourselves with the characters of the book and for some time get lost into them feeling a sense of pleasure and fulfilment or adventure. One book I always love to read again and again and I would like and recommend others to read is “The Alchemist” by Paulo Coelho. Its one book which is life changing for me. It made a huge paradigm shift of how I perceive life. Now let me elaborate it so that others can have a taste of the hidden nectar in the book. 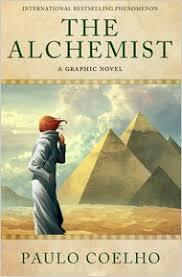 The Alchemist by Paulo Coelho continues to change the lives of its readers forever. With more than two million copies sold around the world, The Alchemist has established itself as a modern classic, universally admired, but still I want to put my views and share as to what I learned from it and relearn whenever I read the book. 1. We need to recognize our Personal calling and have courage to follow our personal legend which is unique to each of us. 2. The language of the soul is to be understood which only we can understand. “You came so that you could learn about your dreams,” said the old woman. “And dreams are the language of God. When he speaks in our language, I can interpret what he has said. But if he speaks in the language of the soul, it is only you who can understand” from The Alchemist. Our soul speaks to us often. We need to learn to listen. The more we listen to our soul the more our life becomes aligned with the will of the universal soul that is the GOD’s will. And when you are in tune with your soul’s desire and goal the universe helps you to achieve it. “And, when you want something, all the universe conspires in helping you to achieve it” The Alchemist. 4. Each one us have a unique path to follow and we just have to read the omens as to which path to follow. 5. We need to understand the language without words. Communication between people and animals always don’t need a language of words which we can understand. The intention of people speaks secretly with us even without words. “ The language of enthusiasm. Of things accomplished with love and purpose, and as part of a search for something believed in and desired.”—The Alchemist. Everything happens for a reason. The people we meet ,the circumstances and events which occur in our life are not by chance but each person each event has a secret message for us. It brings us closer to our personal calling or destiny. The alchemist character says that “Everything has a soul”-like inanimate objects like rocks and water and crystals which collaborates with us. Alchemy is the process of purification so that when we purify our self we are one with the Soul of the World. The philosophers stone can turn metals in to gold. Actually we all have this property of turning ordinary into extraordinary things in our daily life. Transforming poison into medicine. Gold is a symbol of evolution. Gold is the metal which evolved the furthest. 8. “Life is the moment we are living right now.” The Alchemist.. The most important time is the moment right now, the most important person is the one with whom we are right now and most important task at hand is to do good to the person with whom we are at the moment. 9. We should have the courage to follow our destiny and overcome our fear of failure. 10. The journey is more important than the goal. 11.True love does not come in our pursuit of destiny. “If he abandons that, it’s because it wasn’t true love..”. The Soul of the World is part of the Soul of God and the Soul of God is our own Soul. This is the treasure. Thus I recommend everybody to read and reread this book which is a treasure in itself. I am an Electronics and Communication Engineer working in a 500*2 MW Thermal Power Plant in West Bengal, India.I love writing and is a seeker in Speaking Tree a spiritual website .I like reading a lot and is spiritual, love music, love nature and being a mother of two sons love children,and love to flow with life.Writing is my passion.